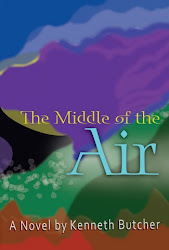 2010 Independent Publisher Book Award Winner: The Middle of the Air won the Bronze Medal for Best Regional Fiction in the South East! A truck hauling materials from the Savannah River Nuclear Processing Site to Oak Ridge National Laboratories disappears along a mountainous stretch of interstate between Asheville, North Carolina, and Knoxville, Tennessee. Suddenly, certain elements in the government want to find the missing truck before they have to admit it ever existed. This sounds like a standard government conspiracy plot except for the Colebrooks, who become the prime suspects in what someone in the government is trying to frame as a terrorist incident. The search for the missing truck quickens as the family races against nefarious government powers. Along the way, they confront Army Rangers along the Appalachian Trail and conduct a late-night stealth mission to an abandoned NASA tracking station deep in the mountains. All of the pieces of the puzzle eventually fall together. In the end, good conquers evil--but with a surprise twist.